What Happens To Your Body During Pregnancy? But while a baby is growing inside a mum-to-be, there are so many other changes going on in her body that people may not realise. Many of the changes that happen to a woman’s body are down to a shift in hormone levels, Dr Khalil explained. “Specifically, an increase in the amount of progesterone and oestrogen causes what we call ‘normal changes’, as they are not caused by a problem with the pregnancy,” she said. Dr Khalil explained when you’re not pregnant, the uterus is a very small organ, around the size of your own clenched hand. 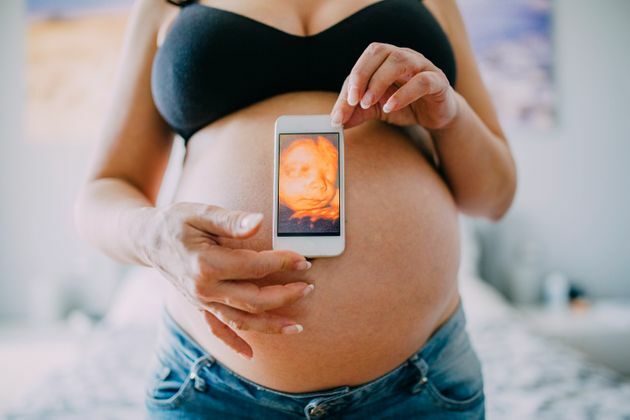 “In the second trimester, the uterus will start to push other organs out of place, as it grows to the size of a papaya, sitting halfway between the stomach and breasts. There are lots of skin changes all over the body. “Redness can also appear in different areas of the body,” she explained. “With higher levels of oestrogen in their body, and the increased blood flow to the skin, women sometimes find that their skin quality improves, although women respond differently to hormonal changes, and others might experience dry skin or acne for the first time in years instead.” Women gain weight during pregnancy (around 15kg), but Khalil said only a third of this is fat (4-5 kg) and a proportion of it is due to an increase of blood and bodily fluids. To keep up to date with features, blogs and videos on the topic, follow the hashtag #MyMumbod. Obviously, there is one major change that happens to a woman’s body during pregnancy: She grows a bump. But while a baby is growing inside a mum-to-be, there are so many other changes going on in her body that people may not realise. Did you know that while a woman’s womb is growing, her internal organs are constantly shifting and moving to accommodate the expanding baby? We spoke to Lesley Gilchrist, midwife and founder of My Expert Midwife, and Asma Khalil, consultant obstetrician and foetal medicine specialist at The Portland Hospital, part of HCA Healthcare UK, to find out what other changes are happening in a mum-to-be’s body. Many of the changes that happen to a woman’s body are down to a shift in hormone levels, Dr Khalil explained. “Specifically, an increase in the amount of progesterone and oestrogen causes what we call ‘normal changes’, as they are not caused by a problem with the pregnancy,” she said. As a woman’s womb grows, her internal organs are moved. Dr Khalil explained when you’re not pregnant, the uterus is a very small organ, around the size of your own clenched hand. But in the first four to 12 weeks, the uterus will grow to the size of a grapefruit. “At this stage, the change isn’t very noticeable,” she said. “In the second trimester, the uterus will start to push other organs out of place, as it grows to the size of a papaya, sitting halfway between the stomach and breasts. Many hormones are needed for a healthy pregnancy, the main ones being progesterone, oestrogen and relaxin. “Relaxin’s role is to prevent the uterus contracting, but it also relaxes ligaments and tendons in the body,” explained Gilchrist. Dr Khalil explained that the relaxed ligaments combined with the growth of the womb, which means the ligaments attached to the pelvic bones will be stretched, can also result in painful pelvic joints.